The star of Bethlehem has always intrigued people. What was it? Could it have been a comet or a meteor or a super-nova? What about a special alignment of planets? The longevity of the star rules out a comet or a meteor. 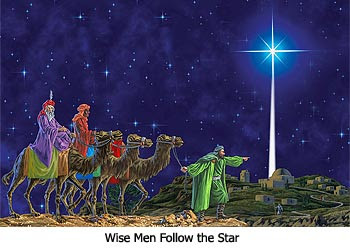 The star had to appear each night for several months in order to lead the magi all the way from Persia in the Far East. The possibility of a super-nova or a planetary alignment is ruled out by the fact that the star constantly moved, leading the magi first to Jerusalem and then to Bethlehem where the star hovered over the house where Mary and Joseph had moved to with the Christ Child (Matthew 2:9-11). The renowned Messianic Jewish scholar, Alfred Edersheim, has proposed another solution to the mystery. He points out that the Greek word translated "star" really means "radiance." The "star" could therefore have been what the Jews called the "Shekinah" — that is, a physical manifestation of the glory of God in the form of a supernatural radiance. The Jews experienced such a phenomenon in the wilderness of Sinai when for 40 years they were led about by a pillar of cloud in the day that became a pillar of fire by night (Exodus 13:21-22). When the radiant cloud moved, they moved. When the cloud hovered, they pitched their tents and settled down (Numbers 9:15-23). This Shekinah later resided in the Holy of Holies after the Temple of Solomon was built (2 Chronicles 7:1-3). Ezekiel describes how the Shekinah departed from the Temple in stages before God allowed the Temple to be destroyed by the Babylonians. 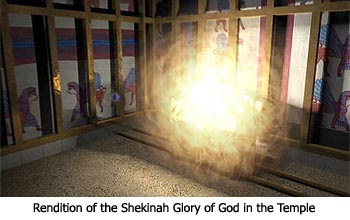 First, the Shekinah moved from the Holy of Holies to the threshold of the Temple (Ezekiel 9:3). Then "the glory of the Lord" moved from the threshold to the Eastern Gate (Ezekiel 10:18-19). Finally, the Lord's presence moved to the Mount of Olives where it "stood over the mountain" before departing the city (Ezekiel 11:23). The Shekinah is mentioned in the New Testament as being present at the birth of Jesus (Luke 2:9), at His transfiguration (Matthew 17:5), and at His ascension (Acts 1:9). Considering the radiant and maneuverable qualities of the Shekinah that are demonstrated in these scriptures, I think it is very likely that the "star" which led the magi was really the Shekinah glory of God. Another mystery associated with the Bible's account of the magi is why did these men "from the east" follow the heavenly radiance? Their very title gives us a clue. Magi is a Persian term for a priestly caste of wise men who specialized in astrology, medicine, and natural science. The ancient historian Herodotus says they interpreted dreams and omens and claimed to have the gift of prophecy. Such men would naturally have been interested in an unusual heavenly radiance. It is also very likely that they would have been familiar with the writings of Daniel who gained great renown as a wise man and interpreter of dreams in the Persian court of Nebuchadnezzar. If so, they would have known his prophecy of "the seventy weeks of years" which is recorded in Daniel 9:24-27. This remarkable prophecy established the general time period of the Messiah's coming by indicating it would be 483 years after a Persian ruler issued an edict to rebuild Jerusalem. The magi had probably been counting down the years since the Jews had been sent back from Babylon to rebuild Jerusalem, and they thus knew the general time period when the Messiah would be born. Because of the Babylonian captivity of the Jews, the magi would also have had access to the writings of Moses (the Torah), and from those writings, they may have come across the Messianic prophecy of Balaam that "a star shall come forth from Jacob" (Numbers 24:17). The final mystery is why God would open the eyes of a group of Gentile mystics and draw them to the Christ Child. Undoubtedly it was for the purpose of symbolizing the universal importance of the birth, to emphasize that although salvation comes from the Jews (John 4:22), it is intended for all peoples. That was certainly the message of the angels who proclaimed to the Bethlehem shepherds that their good news of the birth of a Savior was for "all the people" (Luke 2:10-11). During the Christmas season as you think about the star of Bethlehem that pointed Mankind to the First Coming of the Messiah, keep in mind that Jesus will soon return as "the bright and morning star" (Revelation 22:16). will this "star" or shekinah glory be the sign of the son of man appearing in the sky (matt 24:30) at his 2nd advent? I just got finished reading the article and was wondering that same thing! I agree with Dr. Reagan, I think the "star" was the shekinah glory of God. Scientists can try to come up with this theory and that, all they want, but unless they open their eyes and hearts, they won't ever see it for what we know it was. Wow Hart, Alaska?? You going there to spend Christmas with family? yes, family. born and raised in alaska. besides, christmas just aint the same without snow. here in washington we get the cold, the rain, the bad roads but no snow. what a rip off. its been in the single digits and teens for two weeks then it clouds up and RAINS. last year we had record cold and snow but i was gone and i missed it. i wonder what Nathan or Reagan think about the "sign" of the son of man, if its the glory like the bethlehem star. some ancient scholars believe its the sign of the cross. I don't know.....hey Dr. Reagan, hey Nathan...what do you guys think the "sign of the son of man" appearing in the sky will be?? Hart, if it is the cross, as some believe, then those crosses out in outter space, that the hubble telescope have captured, could be it. Have you looked at them? Theories abound about the star. Here's a good sight with a different take on the whole star idea: http://www.bethlehemstar.net/. From what I can tell, this site appears to be on the up-and-up as far as truth goes. Speaking of "signs" in the heavens, did anyone see the spectacular meteor shower last night? It was worth a crick in the neck and a cold nose! cant say that i have. i dont recall which scholar it was who suggested it was "the blazing cross shining forth" it may have been in one of those xtra "gospels" whatever the sign is the jews knew what he was talking about. i heard other scholars suggest its the shekinah glory so when moses prohesised about a "sceptor" it could have double reference to the bethelehem star and the "sign" of the son of man. No I didn't see the shower last night, but there was one a couple of weeks ago that I watched. And I agree, they are well worth a crick in the neck. The cold nose, that night, was worth it also. Last night would have been a different story though, at least here where I live, in Florida. I would have been sweating! It's pretty warm here now, just about 80out there right now, and very humid! That's Florida weather in the winter time though....one week it's cold enough to freeze your "ornaments" off and the next, it feels like your walking in a pot of warm soup. Yeah Hart, I guess it's what makes you happy for the most part, in regards to where you live. I love it here in Florida.....especially since I am an avid gardner. I don't think I would like "dreary" all the time, and I know I wouldn't like to get out and shovel snow, or deal with ice....walking or driving. Back in the 80's, it actually snowed here. I went belly up when I hit a patch of ice while walking out to get into the actual snow! Was not a pretty site.....at all!! Awesome post about the star, I never really took time to think about it. It was just alight in the sky, but the whole Shekina thing is really cool! You know, I never considered the Shekinah. For a long time I was always under the impression it might have been an angel, just based on how many times the word "star" refered to angels. And all this talk about snow makes me want to move south! After spending 5 years working for a street department 15 years ago, and plowing streets nearly every year (one time for around 36 hrs. straight!) one gets tired of that stuff. We very rarely get a white Christmas (I remember maybe 1 or 2 in 36 years); it's usually a "wet" Christmas. Here in the Louisville, KY area, we usually don't get a measurable snow until about January. And Dorothy, there's been a few times I'd like to have some meds to get me through Christmas. I believe the star was appointed by God and was the light to reveal the Savior's manger. I love the way Jesus later had the fish produce the coins. He is Magnificent, the Messiah, the Lord of all! Amen thunder! Right now I'm in love with Advil! Tim LaHaye had the sign as a giant cross in the sky that spanned the entire world. I think that Matthew 24:30 answers itself: "They will see the Son of Man coming on the clouds of the sky, with power and great glory." Jesus Himself returning is the sign. Interesting...Jesus returns to Jerusalem on one side of the planet but every eye on the planet, including those asleep [Luke 17:34][& as if anyone can sleep while Babylon is getting nuked?] on the dark side, will see Him [Rev. 1:7]. Or will there even be a dark side at His return? I'm perfectly fine with the satellite/TV view of the 2 witnesses in Jerusalem as the people are rejoicing & they don't think anything supernatural is going on until the 2 are resurrected. But this is different. There may be a supernatural distortion of time & space or a supernatural vision granted for that event for all to "see" around or thru the planet & zoom in... I don't buy LaHayes' cross as it would not appear uniformly from both sides and all other points of the globe. There would have to multiple crosses in the sky and "there can only be one" [Highlander?] I don't believe it's necessary for Jesus to orbit the planet either. I think Rev. 19:11 sums it up simply and literally: "And I saw heaven opened, and behold a white horse; and he that sat upon him was called Faithful and True, and in righteousness he doth judge and make war." I think the "sign" of the Son of Man [Matt. 24:30] is the physical sky / heaven is peeled back and everyone will be staring directly into the real Heaven & watching Jesus & the Heavenly armies descending on them. I like Nathan's explanation about Jesus himself being the sign (I've thought the cross thing from Left Behind: The Glorious Appearing to be bit unrealistic) interesting. As for how everyone will see him? Who knows? Satellite? Supernatural vision? With God, all things are possible!!! I think sometimes people tend to think too much. I'm not going to speculate, just find out when it happens since we will be there to see it first hand. The idea of the Star of Bethlehem being the Shekinah is at once a glorious thought and a plausible possibility. Outstanding article, Dr. Reagan. Nathan, I agree with you that the sign of the coming of the Son of Man is Jesus Himself. Never thought of this before, but truth resounded in my spirit when I read it. Thanks for making the Scriptures clear. We have a dvd from this site that explains in an incredible way the events of that time. It is inexpensive, and I highly recommend it. The dvd is appropriately titled "The Star of Bethlehem". We've given out several copies to friends as well. Seeing how this star led these men straight to Jerusalem and then seemingly disappearing while they asked Herod about the Baby, I wonder if this star/light was actually from God. Scripture teaches how satan himself can transform into a beacon of light deceiving the many. Herod, along with satan must have wasnted the child dead and once the wise men left Herod, the light re-appeared and led them straight to the home of little Jesus. Are we sure the light was form God? Yes scripture speaks of a star but is this one from God. Just because scripture speaks of a star, are we for certain it would have to be from God. I find it strange that while Mary and Joseph were visited by an Angel with the message of Jesus birth and Shepherds were told in this manner as well, why would these men need follow a star. Look closer, once the wise men found Jesus, they worshiped him and then later, they were visited in the same manner as all of the others, via an Angelic message. As well, Joseph was instructed to flee to Egypt via an Angelic message and as well, when it was time, to return from Egypt by an Angelic message. Just a thought, well worth investigating, though we may never know the answer this side of Glory. "why would these men need follow a star"? I thot David did an excellent job of explaining it. They knew the prophecies from Daniel's work among them. They knew the time-frame of 483yrs was at hand & they were watching the sky for the sign. They were fulfilling prophecy & their trek was like a living picture-story of the Gentile nations being led to the true light of the world in Israel. DrNo, I like that explanation because it's the only one I've heard that makes sense. In LaHaye's case in "The Glorious Appearing", I understand that artistic license is allowed for a dramatic novel. And since people typically take the cross to be the sign of Christ it fit. But historically, the cross is the sign of Tammuz, the son of Nimrod. So I don't think it would be a cross (not that it couldn't be). But the word translated sign in Matt. 24:30 is say-mi'-on which means an indication: miracle, sign, wonder, token. Whatever it is, it will be unmistakable as everyone will know what it means. And it will be visible [The Greek word is fah'ee-no: appear, seem, be seen, shine] (and, by implication, will be bright ((the Shekinah?))) in the heaven [oo-ran-os': air, heaven, sky]. For all we know, it could be something in outer space, visible to the naked eye by everyone in a 24 hour period. Or something (like the Shekinah) that illuminates the entire galaxy: God's Glory unleashed, as it were. son of thunder [mildly understating it] said "...it will be unmistakable..." Absolutely! I still can't get past Rev. 1:7 "...and every eye will see **Him**...", from all points of the globe!!! That's one of those 1 Corinthians 2:9 thingies: "...Eye hath not seen, nor ear heard, neither have entered into the heart of man..." Kinda like Paul said: [loosely paraphrased from DrNofog's Ver.] "Oh, it was real all right, but I just couldn't tell if I was actually there or not..."
As I read the scripture it says the star appeared and the wisemen recognized it as an announcement of ther birth of the king. I think they were very familiar with the prophecy of Daniel. I did not take it to mean the star rested over Jerusalem I assumed if they were looking for the King of the Jews where else would they go but to the capital of the Jews. Rather they were looking for the King that the star announced 2 years prior. It only reappeared as they set out for Bethlehem. They were overjoyed to see it. I think it was a star because that is what the inspired Word of God says and says what it means. Does not the creator of stars let them shine where and when he wants them to?